Booklet (16pps) with full song texts. Here is the second CD collection from Pete, Tom and Arthur. 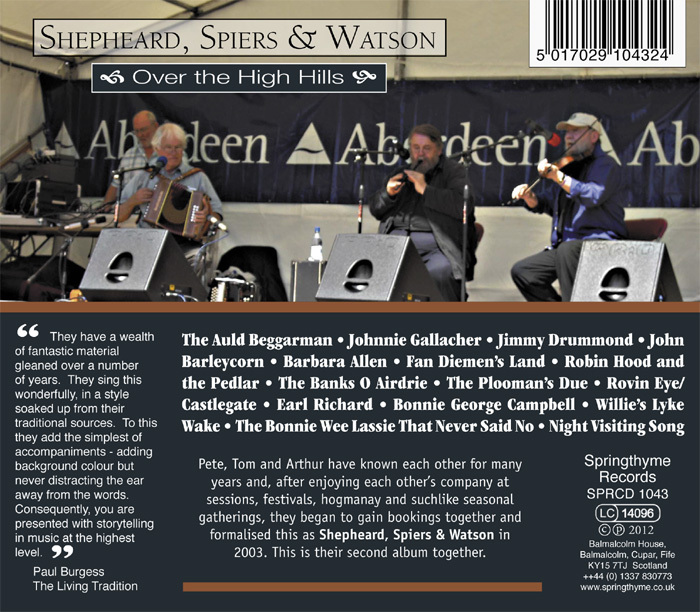 The album includes a fine old recruiting song Johnnie Gallacher, a song in praise of the Clydesdale ploughmen The Plooman's Due, a favourite ballad The Auld Beggarman and a Night Visiting Song that provides the album title in a line from the song. 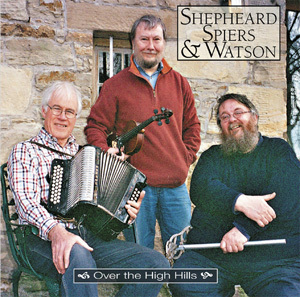 Recognised as three individuals with a long experience of traditional song, Pete, Tom and Arthur bring together a wealth of repertoire accompanied on melodeon, fiddle and whistle and gleaned directly from the many traditional singers they have known. After their first album They Smiled as We Cam In was issued in 2005 they were nominated in the Scots Trad Music Awards as Scottish Folk Band of the Year for 2006. Quite simply, if you want to hear some of the cream of Scots song, look no further than here. Potent examples of their informal art. To find the meaning of any Scots word - enter in the box above and press return. For full song texts click on a song title in the left table. A beggar is given shelter for the night but before daybreak he and the daughter of the house steal away together. Liddle el ti tow row ray. This song was collected from Jessie MacDonald of Macduff in 1966 by Peter Hall. Jessie was a traveller, born in the mid 1870s and learned most of her songs before 1900. Wid ye come doon tae Ugie wi me for a dram? A song in Scots traveller cant. A man is caught stealing gannies (chickens) and is sentenced to kerstardee (jail) leaving his mort (wife) and kenchens (children) to fend for themselves. Ma mort an ma kenchens free. A rare ballad (#132 in FJ ChildÕs collection) that has, never-the-less, been found in the living tradition both in England and in Scotland in the last decades. This version is largely from the singing of Willie Robertson recorded by Hamish Henderson in Aberdeen in the 1950s. Two troublesome men they proved tae be. Learnt by Tom from a recording made by Peter Hall in the early 1960s, of John Stewart, a settled traveller in Aberdeen. Fell in love wi Barbara Allan. From the early 1800s until the abolition of penal transportation in 1853 many thousands of men and women and even children were banished by transportation. Never thinking on your last career upon Fan DymanÕs Land. A young ploughboy goes to town on a spree and falls into a scrape with a young woman. There are Dundee versions, but here the song is claimed by AberdeenÕs Castlegate and the nearby PeacockÕs Close - a place of ill-repute till recent times. As I gaed walkin past. Right fa laddie, toura lye. Tom heard this sung by Jeannie Robertson. The robberÕs name - Bubblin Jockie - is presumably related to the name Baby Lon in the Perthshire version published by Motherwell in 1827. By the bonnie banks o Airdrie O. This Fife bothy ballad tells of a day in the life of the ploughmen in the Spring of the year as they are called out by the foreman to work their horses on the land. An the foreman in the mornin has ordered oot tae saw. The character of John Barleycorn in the song represents the spirit of the harvest, and of the alcohol made from it. That John Barleycorn should die. Tae hear John Barley moan. Tom has this version of Young Hunting (Child 68) from MotherwellÕs Minstrelsy of 1868. The ballad is well known in North American tradition, usually with the title Loving Henry, but there the supernatural element is usually lost. And a shairp sword by his side. This old song may be a fragment of a longer ballad - the story line is bare and leaves much unstated. This version is largely from traveller singer Duncan Williamson of Ladybank. Hame cam his good horse but never cam he. The hero who feigns death to draw a timid maiden is a common ballad theme. This version is largely from Peter BuchanÕs Ballads of the North of Scotland of 1828. A woman is woken in the night by her loverÕs knock at the window. He is but the ghost of her lover and must depart before sunrise to return to the other world. Into the arums of my true love. Music: Pete Shepheard: Hohner 3-row Corona II in A/D/G, Castagnari melodeons in D/G and C/F. Tom Spiers: Milne fiddle in standard tuning, Marshall fiddle in various open tunings. Arthur Watson: Whistles by Generation (D and C), Susato (D and Bb) and Overton (low F). Credits: Recorded by Tom Spiers. Design & transcriptions by Peter Shepheard. Photographs by Lena Shepheard - rear photo at the Portsoy Traditional Boat Festival August 2011. All songs are from traditional sources and are arranged by Shepheard, Spiers & Watson and published Flash Company Music.